General Clinic Terms and conditions. Places are limited therefore your booking will only be secured once payment is received. Entries will be on a first come first served basis. Once the clinic is full, paypal entries will close, but a waiting list will be held. To be put on the waitlist, please email your details, including telephone number to richard@arleymossequestrian.co.uk. Cancellations – places will be refunded (less paypal commission) only if replaced from the waitlist. Correct Headwear and footwear must be worn. Body protectors are recommended. For your own safety, Please adhere to the list of rules for visitors at Arley Moss Equestrian. We are very pleased to announce on Sunday February 16th Grid work clinic with Tyler Cassells BHSII. Various sessions to cater for at all ages and abilities starting with poles and cross poles. Small groups of 3 or 4, £25 per rider. If you are new to Tyler and / or Arley Moss equestrian please email clinics@arleymossequestrian with your experience and group requests.Hopefully this will be the first of many throughout the year. 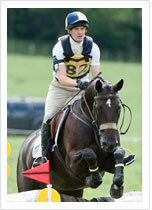 Tyler currently trains and competes at Advanced level at the John Marsden International Eventing Yard in Cheshire. Since the age of ten he has been a practical dedicated and enthusiastic horseman and is on the BEF Excell Talent Programme for 2012 & 2013. Tyler is a freelance rider, trainer and groom with an excellent reputation who regularly attends and rides in national competitions across the United Kingdom as well as holding show jumping clinics throughout Cheshire. By submitting an entry for the clinic you agree to the following terms and conditions. Places are limited therefore your booking will only be secured once payment is received. Entries will be on a first come first served basis. Correct Headwear and footwear must be worn. Body protectors are recommended. For your own safety, Please adhere to the list of rules for visitors at Arley Moss Equestrian. *For health and safety reasons, if you have not attended previous clinics please call Alison on 07769 700 768 to discuss your level of ability before entering online.